There is certainly no shortage of MIDI keyboards on the market, but finding the right one for your particular needs can be challenging. Do you work on a desktop or on a laptop? In a studio or on the road? Are you using notation or sequencing software? Many people find that their replies to those questions fall somewhere along a spectrum, myself included. I work primarily on a desktop, in a studio, with Sibelius and Finale – but quite often find myself on the road with my laptop, and/or using Logic Pro. So while most of the time I could get by with a fairly bulky MIDI keyboard, there are times that I want either something more portable or something more sophisticated — and unfortunately, the two are usually mutually exclusive. is a relatively new product by CME that aims to serve both needs, and it does a remarkably good job of it. Made of molded aluminum, weighing 618g (1.36 lbs), and just 16mm tall, it is easily transported. 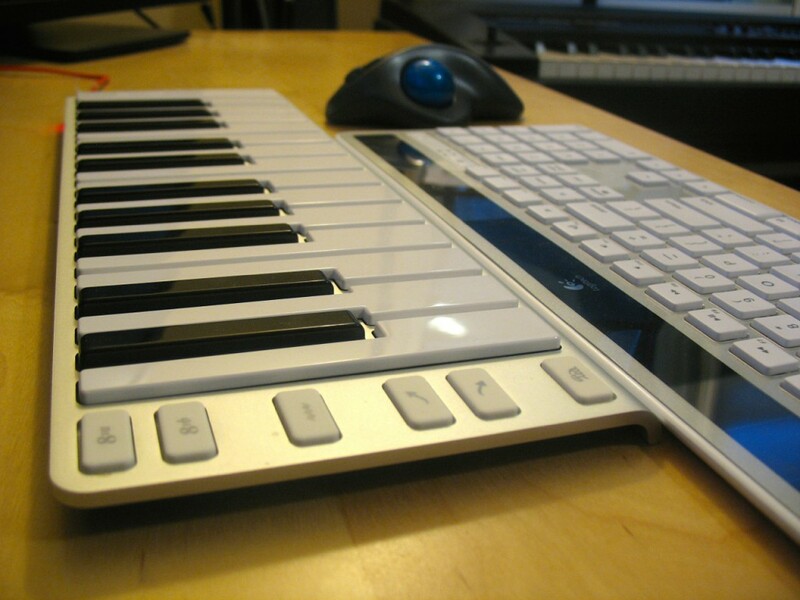 Unlike many “mini” MIDI keyboards, the Xkey’s keyboard layout is full-size (although the keys themselves are ever-so-slightly narrower than a conventional piano; the aluminum grille separates each key with a larger-than-usual gap to compensate for the difference). I was provided with a unit by CME’s US distributor, Virgin Musical Instruments, and I’ve used the Xkey for several weeks, primarily with Sibelius and Finale, but also with Logic Pro X on a 2013 Mac Pro running Mac OS X 10.9.2. Read on for some impressions. for ones with the older 30-pin port. The Xkey comes with a micro USB (micro-B) cable, which is how you would connect the Xkey to your computer or mobile device. 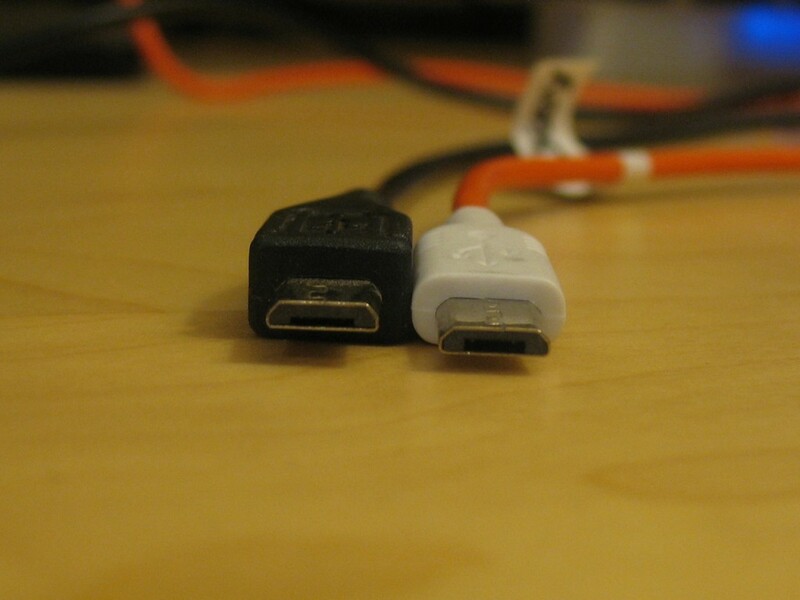 The end that plugs into your computer is the standard USB spec, but the micro end that plugs into the Xkey is a customized “slim” version that is not widely available. CME told me that their distributors carry their cable should a replacement be needed, but be advised that one purchased from your local store or typical online retailer won’t fit into the Xkey. Working with the Xkey was very easy, especially for my typical step-time entry needs. For years I had been using M-Audio’s O2 25-key MIDI controller (later re-named the KeyStudio 25 and since discontinued) because it was one of the slimmest MIDI keyboards available that still used full-size keys. I always thought of the O2 as a small unit, but compared to the Xkey, the O2 seems downright huge. 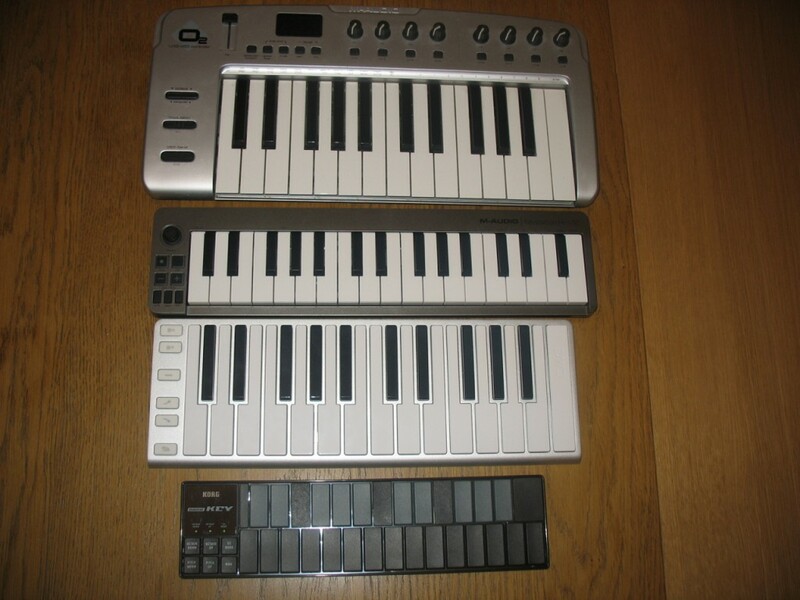 I also own two other mini keyboards, neither with full-size keys — M-Audio’s Keystation 32 and Korg’s nanoKey — and compared to either of those products the Xkey was much more pleasant to use. 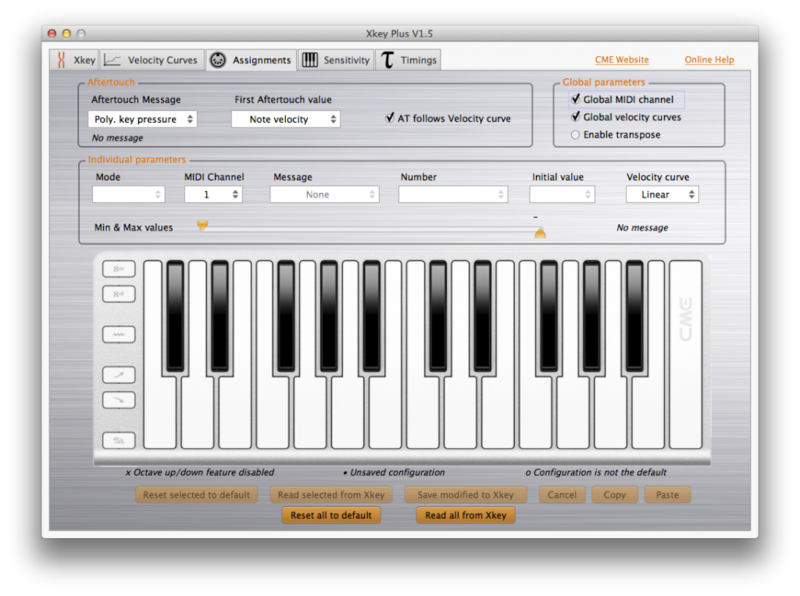 The Xkey has six on-board buttons: one each for octave up and octave down; one for modulation; one each for pitch bend up and pitch bend down; and one for a sustain pedal. The buttons themselves have a nice feel and respond to easy presses, although at first I was pressing harder than I needed to because there isn’t any visual or tactile feedback that the Xkey has recorded your input. The keys themselves have a different feel. They almost feel like a computer keyboard, although they are velocity sensitive, and in fact have polyphonic aftertouch capability — a rarity in a keyboard of this size. Because of its extreme slimness, playing the Xkey won’t feel anything like playing on a real piano or an electric one with weighted keys, or even like my O2. Initially it took a while to get used to, but in time I came to prefer the Xkey to the O2 because it had a more symmetrical feel to a computer keyboard and I found myself entering notes more quickly. The one downside is that the clicking noise generated from the key’s mechanics is significant, especially if you strike the keys with moderate level of velocity or greater. Working by myself in a non-live environment, it’s not an issue. But if you intend on playing the Xkey live or in a studio where the noise could be picked up, or if you use it in a quiet environment in close proximity to others, this could be a problem. Using the Xkey in Sibelius and Finale, it worked just as you would expect (as in this basic demo video provided by CME; a different video showing the product’s features is more useful). In Logic Pro X, it also worked well. Here I got to observe the Xkey’s polyphonic aftertouch capabilities in action. Basically, polyphonic aftertouch allows the player to control the expressiveness of each note independently while its key remains depressed. It takes a skilled synth player to do this well, and even so, most keyboards with aftertouch capabilities will only support channel aftertouch, which is merely the average pressure of all of the keys that are pressed. If you wish, you can tell the Xkey to transmit channel pressure instead, or disable aftertouch entirely. This is done via the Xkey’s secret weapon: its Xkey Plus app, for PC (Windows XP and newer), Mac (Mac OS X 10.5 and newer), and iOS. This free app can customize virtually any aspect of the Xkey, and you can save configurations. You can reassign the channel buttons to send different CC messages, set the sensitivity of each key, set your noise floor level (if the vibrations from your bandmate’s heavy kick drum is causing the Xkey to send false messages), adjust timings of delays and aftertouch, and much more. Some users may never need to adjust these settings, and some will undoubtedly tweak every last option. The apparent simplicity of the XKey coupled with these advanced behind-the-scenes features in the Xkey Plus app is what sets the Xkey apart from other portable MIDI keyboards. Occasionally I found myself wishing for a knob or a slider that was present on my O2, and it would be nice if the Xkey offered some on-board way of seeing its current octave setting. And it would certainly be more convenient if the Xkey used an off-the-shelf USB cable. Still, with its handy size, professional features, and excellent support, the Xkey has secured a new position as my predominant note entry tool. and at Absolute Music, the Xkey is available for £89; distributors for other countries may be found on the Xkey web site. Recently at Musikmesse 2014, CME announced and demoed a 37-key Xkey model, although pricing and availability for the bigger model have not yet been revealed. The problem with this product from my point of view are the letters CME. After my experience with CME, I wouldn’t buy one of their keyboards if it was the last available one on the planet. Along with thousands of others, I, owned the original 88 key CME UF8 keyboard and was left completely in the lurch by CME when, after moving from Windows XP their keyboard required a new driver. They couldn’t even be bothered replying to emails and other messages asking for advice and a solution. Instead, they brought out a replacement version of the keyboard complete with working drivers which worked on newer Windows operating systems. As far as I can tell, they never provided an updated driver for the original keyboards. Their keyboards may well be ok for use with Sibelius whilst on the move, but I would suggest that users would be far safer with alternatives from decent tried and tested manufacturers who care to support their customers. Sadly, my advice would have to be, avoid like the plague. X key support sustain pedal? Where can I get x key 37 at malaysia? Jun: There is a sustain pedal button on the XKey, but you can’t plug an actual sustain pedal into it. CME lists their Malaysian retail partner as CK Music. Hi there. How do you like this compared to your m-audio mini-32? Do you miss having more keys? Actually now I use the 37-key Xkey, the best of both worlds.